An award-winning novel about the value of friendships in present-day Singapore—a “stirring debut…relatable yet unsettling [that] smartly captures earnest teenage myopathy through a tumultuous high school relationship” (Publishers Weekly, starred review). Friendless and fatherless, Szu lives in the shadow of her mother Amisa, once a beautiful actress—who gained fame for her portrayal of a ghost—and now a hack medium performing séances with her sister in a rusty house. When Szu meets the privileged, acid-tongued Circe, an unlikely encounter develops into a fraught friendship that will haunt them both for decades to come. 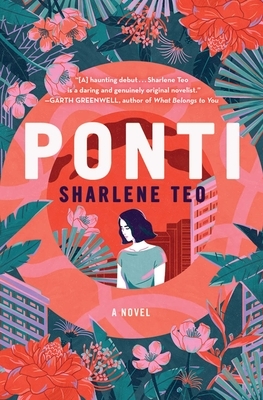 With remarkable emotional acuity, dark comedy, and in vivid prose, Sharlene Teo’s Ponti traces the suffocating tangle the lives of four misfits, women who need each other as much as they need to find their own way. It is “at once a subtle critique of the pressures of living in a modern Asian metropolis; a record of the swiftness and ruthlessness with which Southeast Asia has changed over the last three decades; a portrait of the old juxtaposed with the new (and an accompanying dialogue between nostalgia and cynicism); an exploration of the relationship between women against the backdrop of social change; and, occasionally, a love story—all wrapped up in the guise of a teenage coming-of-age novel…Teo is brilliant” (The Guardian). Sharlene Teo is a Singaporean writer based in the UK. She is the winner of the inaugural Deborah Rogers Writers’ Award for Ponti, her first novel. Her writing has appeared in publications such as Esquire UK, Magma Poetry, and Eunoia Review. She is the recipient of the 2013 David T.K. Wong Creative Writing Fellowship and the 2014 Sozopol Fiction Fellowship.